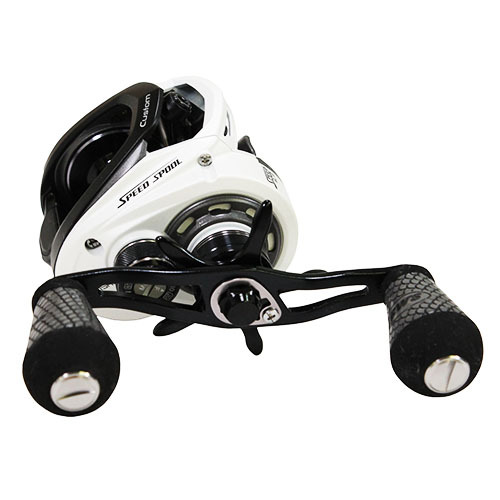 The Lew's Custom Speed Spool MSB Casting Reel features Lew's exclusive Super Low Profile Reel Platform, making it one of the lowest profile baitcast reels ever created. Extremely easy to palm and fish, its strong and lightweight, one-piece aluminum frame and graphite sideplates provide a rigid base of operations. Its high strength solid brass gearing delivers plenty of power as well, and its premium 10 bearing system keeps functioning ultra smooth. The externally adjustable MCS: Magnetic Control System dual cast control system utilizes both an external click-dial for setting the magnetic brake, plus 4 individually disengaging, disc-mounted internal brake shoes that operate centrifugally. It also features Lew's patent-pending Speed Dial line indicator and a rugged carbon fiber drag system that provides up to 14lb of max drag power. Packed with features and lower-profile than ever before, the Lew's Mach Speed Spool MCS Casting Reel delivers tournament caliber performance anglers can appreciate.